The Times, in a leading article upon Spiritualism, which appeared some time back, objected, among other reasons, to the unsatisfactory and unreliable character of the messages which imported to come from the spirits. In the writer’s low view of the whole subject, he argued that the spirits never told us anything of practical value. If, he said, the spirits would tell us who was to be the winner of the Derby that would be something valuable and worth knowing. A gentleman, Mr. B , who is a member of a highly respectable mercantile firm in the City, who knows nothing of Spiritualism, and is wholly unacquainted with the mysteries of the turf, dreamt, some time before the last Derby Day, that No. 19 would be the winner. He mentioned it to his partner And several of his immediate friends, and was himself so strongly impressed by the premonition that he was inclined to bet a considerable sum on the faith of this dream, or, as I should call it, spiritual impression. He was restrained, however, by his senior partner, and induced to limit his stake to ten pounds. Enquiries were made as to the name of the horse, but at that time the official list with the numbers of the horses had not been published. Mrs Daffodil’s Aide-memoire: Mrs Daffodil, who does not follow the Turf, understands that there is a horse-racing contest to be run to-day in the States, called the “Kentucky Derby,” modeled, no doubt, on the well-known “Derby Stakes” held annually at Epsom Downs in Surrey. Mrs Daffodil is sceptical of the claim that Blair Athol (pictured above) was not bruited as potential Derby winner. His potential had been recognized by many in the racing world and bookmakers had paid a stable lad to nobble the poor creature by kicking him. 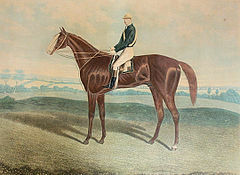 Blair Athol had a successful, if brief career, in 1864, winning the Derby, as well as five other races. He then retired to a successful career at stud. This entry was posted in Animals, News and Announcements, Supernatural, Victorian, Wonders and Curiosities and tagged Blair Athol, Derby winner, dreams, Epsom Derby, horse racing, Kentucky Derby, predicting the Derby winner, prophetic dreams, telepathy on May 3, 2014 by chriswoodyard.